Myths and icons are usually considered as untouchable or unreachable entities: you can try and tell their stories, but there is always something about them that will be left unsaid or will be shrouded in mystery. The tangible proof of this truism is represented by the film Looking for Oum Kulthum, directed by Shirin Neshat and Shojat Azari. Currently on a short tour in Italian museums and cultural institutions, the film will be screened tonight at Bologna's Cinema Lumiere and tomorrow at Milan's La Triennale. Despite its title, the movie does not tell the story of Oum Kulthum, but focuses on an Iranian director, Mitra, who's trying to shoot a film about the legendary Egyptian singer. Born Fāṭima Ibrāhīm al-Biltāgī either in 1898 or 1904 (depending on the source), in the village of Tamay e-Zahayra in the Nile Delta, Oum Kulthum first started singing for her family ensemble dressed as a boy (in the film the scene is recreated by young Nour Kamar, a Tunisian girl with a larger-than-life voice). Mohamed Aboul Ela, a modestly famous singer, taught her the old classical Arab repertoire and, as the years passed, she became known and loved in the Middle East and North Africa for her melancholic and dramatic voice. Her concerts featured an orchestra and revolved around a few songs centred on themes like love, longing and loss: usually the concerts would only include two or three songs, but they lasted for hours as Oum Kulthum would repeat a line, improvising it or altering the intensity of a note, a technique that often reduced her audience to tears. Poet Ahmad Rami wrote 137 songs for her, while in the mid-'60s she collaborated with composer Mohammed Abdel Wahab. Their first track together - "Enta Omri" (You are my life") - became one of her most famous and loved songs. Gamal Abdel Nasser, who became the president of Egypt, was a fan and his speeches and messages were often broadcast after Oum Kulthum's monthly radio concerts that took place on the first Thursday of every month. Known as "Kawkab al-Sharq" (Star of the East), Oum Kulthum died in 1975 and her funeral procession became a national event, with around 4 million Egyptians mourning her in the streets. If you're interested in finding stories about Oum Kulthum's life in Neshat and Azari's film, you will be greatly disappointed as this is definitely not a documentary about the singer. The two Iranian directors employ indeed the formula of the "film within a film" to analyse a metaphor: their movie follows a contemporary director, Iranian Mitra (Neda Rahmanian), who is working on a biopic on the Egyptian singer. After finding the main actress for the film, Ghada (Yasmin Raeis) an unassuming school teacher with a beautiful voice, Mitra starts shooting and begins finding obstacles on her path. Some members of Mitra's team feel that, being Iranian and not speaking Arabic she is a foreigner and therefore she is not fit to do a film about legendary Oum Kulthum. And while one actor doesn't seem to show any respect to Mitra because she is a woman, the filmmaker is also living a dramatic personal situation. She is indeed haunted by the ghost of her son, now an angry teenager, whom she left behind in Iran when he was 7 years old. Little by little, Oum Kulthum becomes an elusive ghost that Mitra can't grasp and capture, while the film shifts its focus from a myth and a legend to look at the condition of women and at the price they have to pay to follow their dreams and career. In Mitra's film Oum Kulthum seems to have a magnificent career while Egyptian women are fighting for their rights just like Mitra herself who is only superficially liberated since she still has to overcome the barriers set by her (male) producers with their commercial requests or live with her guilt, a feeling amplified by her resentful husband and son's phone calls and messages. Both women aim for greatness and both find barriers, reacting in their own ways, giving up a part of themselves to let their dream live: Oum Kulthum seemed capable of juggling private life and career (the former remained a mystery and no gossip ever circulated about her), while Mitra's public and successful career gets instead destroyed when her family life falls apart. Mitra sacrifices her family life and her son in particular; Oum Kulthum may have sacrificed family, romance and the possibility (and joy) of being imperfect and even vulnerable: in Mitra's film she's always immaculately dressed in her long evening gowns accessorised with a matching scarf held for a dramatic touch in one her hands as she sings; her hair is perfectly sculpted and at times her eyes are hidden away behind her trademark sunglasses (this could actually be a good movie for a fashion film festival...). Resenting the flawless singer, Mitra tries to sabotage the performance of her career, a concert for Egyptian President Nasser, in which she attempts to portray her as failing, but eventually loses all the passion she had for her project. Despite its rather inconclusive ending Looking for Oum Kulthum doesn't hurt the status of the famous Egyptian singer (though it would have been even better to see archival footage incorporated in the film) who transforms from legend to symbol and artistic metaphor. The film works at its best when we are shown clips from Mitra's biopic, with Oum Kulthum being introduced to the king or becoming a favourite of President of Nasser (but don't take the historical references as correct: critics highlighted how the women's protest showed in the movie actually took place in 1919 and not in 1914 while the home town village of Oum Kalthoum is presented here as relocated in fable-like ancient times); the story loses its rhythm instead when it looks at the life of Mitra, who gradually turns into an alienated character and it is not developed as much as she should. Screened last year at the Venice Film Festival, Looking for Oum Kulthum remains for its continuous alternations between cinema and metacinema, one of those movies best enjoyed at art events rather than in proper film theatres. After all you need time to elaborate its themes and find the answer to the film main question - was it worth it for Mitra and Oum Kulthum sacrificing their private lives and family for their dreams and careers? The members of the audience will decide the answer after seeing the final confrontation between the two characters - Mitra and an older version of Oum Kulthum (Najia Skalli) - left looking at the horizon, silently contemplating their successes and failures. Opera and ballet have always been a great inspiration for fashion designers and in multiple posts on this site we often looked at how designers have collaborated throughout the decades with theatre ateliers to create costumes for very unique performances. The latest one to join the numbers of fashion designers who have tried their hand at working for the stage is Alessandra Facchinetti. The former Gucci, Valentino and Tod's creative director, recently designed costumes for Giuseppe Verdi's "Don Carlo" (on until February next year, you can check the dates of the performances here) that opened last week at the Theater St. Gallen in St. Gallen, Switzerland. Verdi composed the Grand Opéra for the Paris World Exhibition in 1867: divided in four acts, the opera is based on a libretto by Joseph Méry and Camille du Locle (later on translated into Italian by Achille De Lauzières) after the dramatic poem Don Carlos, Infante of Spain by Friedrich Schiller with some scenes inspired by Roi d'Espagne by Eugène Cormon. This complex and monumental opera (it exists in different versions and with various cuts) debuted in Paris in 1867 and later on was staged in Bologna, Rome and at Milan's La Scala. Taking place in mid-16th century in Spain, the story revolves around the personal and political conflicts and struggles in the life of Don Carlo, Infante and son of Philip II, King of Spain. Don Carlo is betrothed to Elisabeth of Valois, daughter of the King of France, but he loses her when the peace treaty ending the Italian War of 1551-59 between the Houses of Habsburg and Valois establishes that she must be married Carlo's father. Carlo has a loyal friend, Rodrigue, Marquis of Posa, but he has more foes in the revengeful Princess Eboli, the King's mistress who mistakenly thinks Carlo is in love with her, and in the Spanish Grand Inquisitor. In the opera Don Carlo is an impulsive man, Elisabeth is a tragic figure destined to be unhappy, while the Great Inquisitor seems have power on all the characters on stage, and often acts as the cruel arbiter of their destinies. The Inquisitor also reunites in his character the conflict between the Church and the State. Director Nicola Berloffa wanted a decadent atmosphere with historical connections in the opera, but he also hoped to inject some references to Haute Couture in the 90 costumes featured in the opera, among them uniforms, tailcoats and capes for men, and sumptuous gowns for women. Facchinetti moved from one main inspiration - the crisis and consequent end of the monarchy - and combined it with art and cinematic inspirations. The main references came from John Singer Sargent's portraits and the costumes in Luchino Visconti's films. Fans of the Italian director will easily spot elements calling to mind the costumes designed by Piero Tosi and made by Umberto Tirelli for Visconti's L'innocente with some references to Senso (Tosi and Tirelli made outstanding contributions to the history of cinema as they created a visual language that became well coded and crafted, turning into a solid reference for many fashion and costume designers). Facchinetti also attached symbolic meanings to colours: there is a somber atmosphere throughout "Don Carlo" (all the arias are often sorrowful in this opera that also includes an "auto-da-fé", a public parade and burning of condemned heretics) with black, brown, forest green and prune shades prevailing especially in the uniforms of the main male characters. The designer opted for a pale lilac for Elisabeth as a metaphor for her loss of happiness and a deep electric blue and dark violet for Eboli to hint at the latter's disruptive power. Tone on tone embroidered and black beaded elements elevated the gowns from costumes to couture. There are no crowns on the stage as monarchy is losing power (black and brown, shades evoking mourning rather than celebrations, are the colours favoured for Elisabeth's coronation gown), while the conflict between Church and State is referenced in the Inquisitor's costume, a priest's cassock matched with an oversized stole covered in circular beaded embroideries. While younger designers may be more interested in creating fashion for real people and trendy pieces for modern consumers, costumes are a great way to experiment with other mediums, creating something that lasts longer than a season and learning at the same time a lot in a very different environment. Designing for the stage means indeed studying the story behind an opera, a ballet or a play and developing through garments and accessories a character on a psychological level as well. Last but not least, a costume designer must take into account the needs of the performers, without forgetting the members of the audience, and therefore designing costumes that allow singers, actors and dancers to move, while at the same time coming up with shapes and silhouettes that, through their volumes, help the members of the audience grasping the personality of that character. Facchinetti worked on this project for around a year (the designer posted on her Instagram page some images showing the work in progress behind the scenes and some of the costume details) and she definitely managed to gain a lot of experience when it came to textiles and fabrics. For these costumes she worked with a Como-based company to develop silk jacquard textiles, while the laces came from the century-old company Forster Rohner (that provides fabrics to fashion houses such as Dior, Balenciaga, and Chanel; the fabric for the black velvet gown with broderie anglaise inserts donned by Alex Penda as Elisabeth in the last act came from Forster Rohner). Facchinetti was quick to rise to fashion fame, but she was even quicker at losing the favour of the fashion media (something that wasn't entirely her fault, but was to be attributed to a sudden lack of support from her once mentors, including the late Vogue editor Franca Sozzani and Sozzani's partner Vogue Italia/L'Uomo Vogue art director and advertising company director Luca Stoppini...). In the case of Facchinetti maybe the loss of the fashion industry may be the gain of the costume design profession, after all, you may need patrons in the world of performing arts, but you don't need editors who make or break your career. Pink has become a very fashionable colour and the Museum at FIT is currently celebrating this shade with the exhibition "Pink: The History of a Punk, Pretty, Powerful Color" (until 5th January 2019). Curated by Valerie Steele, the museum director, the event looks at how the meaning and significance of the pink colour changed in the last three centuries going from sweet and feminine to punk, powerful and rebellious. "Pink" is therefore a sort of journey from 18th century Pompadour pink to "Millennial pink", passing through Schiaparelli’s Shocking pink. One of the most famous references to pink appears in Stanley Donen's 1957 film Funny Face starring Audrey Hepburn, that featured the joyous number "Think Pink!" an ode to the colour. Three years later, the shade was still going strong: Italian magazine Annabella dedicated in October 1960 a central spread featuring the latest partywear in different shades of pink - from peony to bright camellia and rhododendron, from watermelon to pink grapefruit. The magazine also stated that pink-lilac had replaced white for the dresses of Christmas debutantes. The styles were different and so were their materials, going from long evening gowns to short cocktail dresses in bicoloured taffeta, raspberry pink brocade or in a deep and sensual velvet. Judging from the elegant or cute styles, pink was still feminine and romantic at the time and there wasn't anything rebellious about it (though the bi-coloured taffeta dress with its puffy skirt was an attempt at presenting a fresh and unconventional look...). The magazine didn't add the name of the designers to the gowns, but it usually featured mainly French and Italian houses, so you can try and guess who designed what. While you're busy in this fashion quiz, remember, "Think pink! Think pink! if you want that quel-que chose," as Kay Thompson in the role of fashion magazine editor Maggie Prescott sang in Funny Face. There's something about Aleksandr Rodchenko in the graphics created for Moscow-based cult cafe Enthusiast by Russian designer Dima Pantyushin. The cafe is known for its colourful interior design and its trendy clientele of creative minds, but also for Pantyushin's posters celebrating different events organised in the venue. The posters are characterised by bold colours, motifs and shapes arranged in a visually striking yet minimalist way that quite often calls to mind the Russian Telegraph Agency (Rosta) propaganda posters of Soviet Russia. A while back Pantyushin collected the images in a limited edition book, Posters for Motocafe "Enthusiast" 2013-2016, released in 250 copies and featuring 299 of the posters that have become collectors' items for the cafe regulars. The poster colours and shapes are the inspiration for the A/W 18 collection of Russian design duo Nina Donis. Nina Neretina and Donis Pupis are well-known for favouring clean lines and practical and functional clothes based on a palette of strong and bright colours. Blue and black, beige and red or white and azure stripes and large dots characterise the new collection: Moscow-based creative minds and fashionistas may see echoes of the Enthusiast posters in the dots (that seem to have become a Nina Donis trademark as well), but the stripes seem to be a combination of the main geometrical motifs in Varvara Stepanova's unisex sport uniforms and the interior decor of Manchester's Haçienda. One dress collaging a selection of stripes in a variety of colours will definitely call to mind in older fashion fans with a passion for music the Haçienda pillars painted in hazard stripes. The French terry knee-length dresses and shirts, trousers and tops forming the backbone of the collection feature an artisanal element - elbow pads in contrasting colours hand-painted on the fabric. There's a bold yet balanced minimalism in the collection, that proves simplicity is often the key to look more striking, but maybe the best thing about the designs is that they are conceived as a Lego building set: you can get different items from the collection and combine them to create a more personal look and style via contrasting and clashing patterns. The name "Amazon" doesn't certainly conjure up visions of highly conceptual design pieces: we collectively turn indeed to the e-commerce giant to find extremely good deals and bargains for all sorts of needs. While there may be some interesting interior design pieces on offer from various vendors, for what regards fashion, Amazon's taste and style still needs to be improved. For example The Fix, Amazon's in-house affordable accessories label available exclusively to the retailer's Prime customers, may have to be "fixed", and possibly purged of low quality copies of products by more famous fashion houses and brands. Yet in the last few months Amazon seems to have been taking some steps towards a serious colonisation of the fashion industry. While the leader in online retailing recently collaborated with Calvin Klein on a series of events in the States, it also launched this week its first European pop-up women and menswear shop. Based in London's Baker Street, the shop stocks several brands including Love Moschino, Tommy Hilfiger, Calvin Klein, Puma, Levi's and Vans, and Amazon Fashion's own labels (Iris & Lilly, Truth & Fable, Find). Merchandise and brands have been rotating everyday offering consumers fashion pieces aligned with the A/W 18 trends, ath-leisure and partywear (the latter will be the star this weekend). Other highlights have so far included stylists available in shop and assorted debates and discussions like an event by Vogue beauty (it's only natural for Vogue to jump on the Amazon bandwagon as it seems to be one of those rare places at the moment where money is flowing...). Products can be purchased in the shop or virtually using Amazon's SmileCode technology (open the Amazon shopping app on a mobile device, select the camera option, search for a product, then scan the SmileCode) or tablets placed around the pop-up space that can provide access to the complete range of items available on Amazon (the one in the shop is a selection "curated", as they say nowadays, by the Amazon Fashion team). The pop up shop (open until Saturday) is a way to strengthen Amazon's connection with its offline consumers, but the e-commerce giant has got other tricks up its sleeve. Amazon Japan has indeed opted to go down the futurist conceptual path as it recently enlisted for its "At Tokyo" selection Anrealage's futurist innovator, designer Kunihiko Morinaga. Consumers can read an interview with Morinaga and check out and buy the products he recommends on his "My Amazon" curated page that includes a Moleskin notebook, Montblanc ballpoint pen refills and a pot pourri by Florentine Officina Profumo Farmaceutica di Santa Maria Novella. Morinaga also added to his selection two essential items for his job that make him look more like an investigator than a fashion designer: a magnifying glass to study the texture of his garments and a UV torchlight, indispensable to enhance or change the colours and patterns on Anrealage's designs and play with his favourite themes (lights Vs shadows). 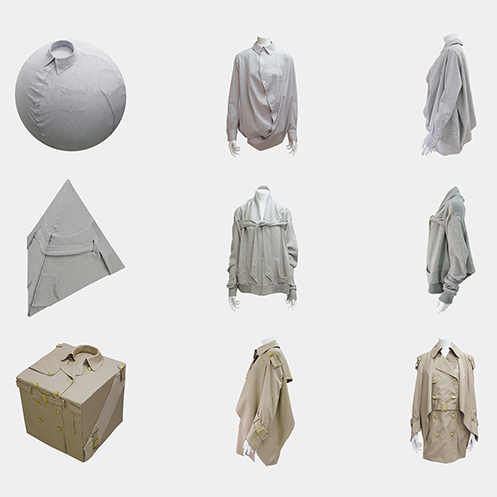 Amazon's Anrealage selection includes functional garments such as T-shirts and patchworks shirts, jackets and bags, but, surprisingly enough, it also features two conceptual designs by the Japanese brand. For the occasion the cube t-shirt and trench coat from the S/S 09 collection were redesigned and recreated with an Amazon Fashion logo. As you may remember, that collection was inspired by basic geometric forms such as a cube, a sphere and a pyramid and revolved around the possibility of modelling a garment over a three-dimensional shape and then applying that garment to the human body to see what it would look like (View this photo). Seen in this new incarnation, when refolded in a cube shape, the trench coat and shirt uncannily look like Amazon packages (a rather successful example or fashion détournement...). The operation makes you think a lot: while for a brand like Anrealage being featured on Amazon means reaching out to more people, for Amazon this collaboration opens a view on a less banal type of fashion. So far the e-commerce retailer understood the importance of trendy garments and accessories and of being associated with popular and famous brands, but Amazon Japan has rapidly moved onto conceptualism and extremely futuristic designers. Was this decision dictated by a will to genuinely democratising conceptual pieces (the "box" T-shirt and trench coat retailed at around €170 and €424 and were soon sold out) or could this be for Amazon just another way to make more money or get closer to real designers to study them a bit better and implement a more advanced fashion design algorithm? Keeping an eye on the next Amazon developments will reveal the answers to these questions and maybe the wider plan of the e-commerce retailer. In the meantime, it is interesting to note how Amazon's London-based pop-up almost coincided with Virgil Abloh opening his Wizard of Oz-inspired concept store in Mayfair's Bruton Street selling his S/S 2019 menswear collection for Louis Vuitton that seems to feature luxury copies of cheap Wizard of Oz shirts and textiles sold on Amazon. Maybe the e-commerce giant is genuinely preparing to lead fashion, rather than follow it. After Copying Garments and Accessories, Is It Possible to Successfully Copy a Business Model? In yesterday's post we looked at the umpteenth copyright infringement case regarding a fashion product. Yet at the moment there's also another type of copying mania in the fashion realm: it seems indeed that, after copying actual products, brands have moved onto replicating specific business models. Up until last year luxury houses seemed indeed to be more interested in collaborations with hip labels such as Supreme, but at the moment they are more intent in recreating the hype surrounding it with the hope of generating new sales. In July Burberry announced for example that it was going to follow a model that has done wonders for Supreme: each Thursday the streetwear brand releases new products, included limited edition designs that prompt consumers to line up outside its stores. Starting from this month, Burberry implemented a new system with regular drops of designs from its B Series collection. The products will be available on the 17th of every month exclusively through the brand's Instagram, WeChat, Line and Kakao (the latter are two popular mobile messaging platforms in Asia) for just 24 hours (starting at 12pm UK time). The idea for the brand, currently led by creative director Riccardo Tisci and CEO Marco Gobbetti, is to create expectations, get consumers excited and keep products fresh. The final hope is to successfully apply the Supreme "drop" model to the Burberry products, possibly obtaining the same results Alessandro Michele got at Gucci, a brand that got revamped enough to rise the interest of a younger generation of consumers. In many ways there is nothing to get surprised about this new Burberry strategy as the drop model is indeed followed by retailers in all sorts of fields as it keeps consumers interested in the new selections of products they may find on offer, from T-shirts to lipsticks passing through food. The drop model can work magnificently to test a new item and get immediate feedback or build instant hype: limited seasonal specials seem to fly off the counter whenever they become available at cafes and fast food chains, or think about Danish chain Flying Tiger and its monthly selection of cheap products that regularly changes according to the season to ensure consumers will come back. This was the same technique employed decades ago in shops like Fiorucci that seemed to have a wide range of products at affordable prices and a stock that rotated quickly and that therefore prompted consumers to visit the store at least once a week. That said the drop model seems to be more successful with limited and affordable goods and it is worth highlighting that this month's first Burberry drop featured a 350 Euro T-shirt. Burberry went through several changes in the last few years: one of the main disruptions in its delivery schedule - the "see now buy now" model - didn't seem to guarantee an immediate rise on sales, besides reports about the company destroying millions of pounds worth of unsold stock last year didn't play in Burberry's favour as well (will the monthly drop help them planning and creating more targeted collections to limit waste?). While this new experimental disruption may bring new and younger customers especially from Asia, it must be said that there are differences between Burberry and other brands using the drop system: Burberry is indeed a traditional fashion house, a heritage brand based on seasonal collections released at specific times of the year; Supreme is a smaller company and its drops revolve around a variety of products released in limited supplies rather than on huge quantities; often these items get resold online and in other outlets, something that contributes to generate a hype, a phenomenon tangibly represented by the lines in front of the Supreme stores. In the case of Supreme, the drop is just one component of its hype: last year the brand founded by James Jebbia collaborated with the Metropolitan Transportation Authority (MTA) in New York, producing Supreme-branded metrocards that went instantly sold out. This year the brand approached Post Studios, The New York Post creative agency, and launched an advert that caused a supreme (pun intended) frenzy, a New York Post promotional cover wrap that became a must-have. In a nutshell, while the hype sells, Supreme has consistently tried to weave its reputation in the fabric of the city where it was founded and where it is based. Supreme is part of the local DNA and that's why people may be willing to identify with it. Burberry thinks that the drop may be the chance to bond with consumers, but its monthly offer of products represents a commercial need to create a frenzy and an interest online outside of the main seasonal collections. Time will tell if this is just a social buzz or a good marketing strategy, but it is hard to see how a monogrammed T-shirt with the new logo designed by Peter Saville can save the brand. Like Supreme turned to New York's MTA or The Post, Burberry may have to do the same, trying to engage with local British institutions and real people. London Oyster Card anybody? For many of us the smell of pine evokes air fresheners and long car journeys or taxi trips to the airport. Yet for French fashion house Balenciaga it may end up conjuring up the smell of legal trouble. The fashion industry is indeed becoming a veritable dark forest of copyright infringements and everyday there seems to be a new lawsuit between this or that brand over an allegedly copied design. One of the latest cases involves Balenciaga and the Car-Freshner Corporation. The French fashion house recently released a tree-shaped $275 keychain, but the design looks extremely similar to that of the iconic Little Trees products. The Car-Freshner Corporation (owning the rights to Little Trees) and Julius Sämann Ltd therefore decided to sue Balenciaga (Car-Freshner Corporation and Julius Sämann Ltd., v. Balenciaga America, Inc., 1:18-cv-09629 (SDNY)). The pine tree-shaped disposable air freshener goes a long way back: trademark for the little odor-fighters was secured back in the early '50s when Julius Sämann, a German-Jewish chemist and businessman, filed a patent for paper impregnated with "odor-destroying, air-perfuming substances," a cellophane wrapper and a string to hang it on. The product became an instant success and it is still selling strong. Several companies in Europe produce Little Trees under license from Julius Sämann Ltd. using the names Wunder-Baum (in Austria, Denmark, Finland, Germany, the Netherlands, Norway, Poland, Romania, Slovenia and Sweden) and Arbre Magique (in France, Belgium, Italy, Portugal, and Spain). It is undeniable that the keychains look remarkably similar to the trade dress-protected Little Trees car air-freshner that come in different colours and patterns; Balenciaga also copied some of the specific colours and graphics and the product is described on some sites as "inspired by car fresheners". The description on the product page on Matches Fashion states indeed: "Designed to resemble a classic car air-freshener tree, Balenciaga's green leather keyring will lend a note of character to your accessory roster." Legal documents for the case argue that Balenciaga's keychain design could therefore confuse consumers despite the nature of the product and the difference in prices. But a judge may rule against the plaintiffs (Car-Freshner Corporation and Julius Sämann Ltd.) as, after all, consumers are perfectly capable of distinguishing between an air freshener selling for $3 in the States and a luxury leather keychain selling for $275. Similarity generating confusion may therefore not be a valid case, as consumers still know the difference between a cheap product and a luxury item, but it is clear that the product infringes instead a trademark (in the case of Little Trees, the coloured pine is undoubtedly a distinctive mark of the product/brand). Balenciaga may play the irony and parody/satire card, explaining that this is a fun accessory in the same way Moschino did a Windex bottle-shaped fragrance called Fresh (plus a mobile phone cover and a series of accessories with the same design) and Windex never sued the brand probably because it realised consumers are not likely to confuse a detergent with a fashion house. That said, there is something that may rule in favour of the plaintiffs: Little Trees has a range of products sold on its own store including luggage tags, key rings, greeting cards, socks, shirts and bags (just to mention a few). The luggage tags actually look a bit like Balenciaga's keychains, but, what's even more remarkable is the fact that a while back Little Trees granted a license to designer Anya Hindmarch to use the tree design for leather tags/keychains for handbags (in the same way other companies including Buffalo Wild Wings, Kia Motors and Capital One also licensed air fresheners from Little Trees). Balenciaga never applied to get a licence, but, seeing the other products and previous collaborations, consumers may think this is an approved partnership between Little Trees and the French fashion house. In a nutshell, Balenciaga would be guilty of unauthorized use of the design. The plaintiffs are currently seeking injunctive relief which would bar Balenciaga from the "manufacture, production, sale, import, export, distribution, advertisement, promotion, display, or other exploitation of the infringing product." The Car-Freshner Corporation and Julius Sämann Ltd. are also seeking monetary damages including profits made by Balenciaga in connection with the still ongoing sale of the keychains. In the meantime the case between New York-based City Merchandise, Inc., a producer of souvenir items, against Balenciaga America (City Merchandise, Inc., v. Balenciaga America, Inc., 1:18-cv-06748-JSR (SDNY)) continues. As you may remember, that case referred to the "Multicoloured New York" line of bags by City Merchandise, created by the souvenir merchandise company around November 2014, and featuring a collage of NYC landmarks (the Statue of Liberty, the Freedom Tower, the Chrysler Building, the Flatiron Building and the Empire State Building) on an airbrushed hot pink sky with large, purple letters, unevenly bordered in white. The same image was replicated by Balenciaga on a series of products. The case was filed in July, but the American branch of the French house denied any wrongdoing stating that the City Merch bags lack copyright protection or is invalid since it shows common scenes and sets (but, it should be highlighted the arrangement, layout and colours are original, it was indeed created by Rafael Valentierra, but the copyright, as it happens in these cases, lies with the company he created the design for) and consequently denied it ran afoul of federal copyright law. City Merchandise has recently amended its complaint and is seeking to immediately prevent Balenciaga America, Inc. from exporting and/or selling the allegedly infringing products outside of the U.S.
Deborah Gindi, current president and owner of City Merchandise, released a declaration on 11th October 2018 (that we received via the company's layer, Mr Edward Toptani) stating she was surprised and puzzled when she entered a Balenciaga shop and saw a bag with a design that looked remarkably similar to their line of bags. In her declaration she claims "it was my general belief that infringers generally knock-off high-end products", but in this case she discovered something peculiarly different. Rather than selling inferior quality knock-offs for relatively inexpensive prices, here was a luxury version of a very affordable bag (a tote by City Merchandise costs around $20, Balenciaga will set you back almost $2,000). Mrs Gindi's main worry is that City Merchandise's products will therefore be considered as cheap knock-offs of Balenciaga's designs by people who are not aware of the situation and claims that her company lost sales as a result of the French house reproducing their designs. She therefore proceeded to apply for a preliminary injunction to prevent Balenciaga America, Inc. from taking any steps to transfer, export, distribute and/or sell any of its U.S. inventory of products that infringe upon City Merchandise’s copyright (once exported the products would not be subjected to US copyright law and the fashion house would avoid having to pay City Merchandise for damages for such illegal sales; the same request done by the Car-Freshner Corporation in regard to the keychains) and an order of seizure of Balenciaga's infringing merchandise (Balenciaga states it has already voluntarily stopped displaying and selling them in the United States). These copyright infringement cases are not new to Balenciaga: Demna Gvasalia, current Creative Director at the French house, has been under attack for using popular designs and turning them into luxury products or copying designs without crediting them (think about DHL T-shirts, IKEA shopping bags or his appropriation of the Ruff Ryders logo). In the case of the pine tree keychain Gvasalia should have done his research before putting the product on the market: Car-Freshner fiercely defends its trademark of the tree-shaped air freshener design and has filed several lawsuits against makers of lookalike products and companies that use their products in other commercial media (throughout the years Car-Freshner sued a series of air-freshener makers, but also companies that produced holiday greeting cards that bore a glow-in-the-dark image of a scratch-and-sniff tree-shaped air freshener...). Gvasalia has often explained in interviews that he loves injecting irony in his designs and elevating something cheap to luxury (hence the City Merchandise bags or the accessories decorated with a bland stock photo of cute animals...). Shame he never considered the legal implications and consequences of his "ironic exercises" in fashion détournement. It is very trendy nowadays to indicate on social media what's your profession, but, quite often, we let our imagination and fantasy run wild and add after our names and surnames a long list of jobs in different fields to prove we are outstandingly creative. Yet there have been figures in the history of design that have genuinely covered various roles and positions throughout their careers, making a real and tangible difference with their unique designs. Among them there's Milanese Gio Ponti, currently being honoured at the Musée des Arts Décoratifs in Paris with a dedicated retrospective. "Tutto Ponti - Gio Ponti Archi-Designer" (until 10th February) is a multidisciplinary journey through the 57-year-long career of the Italian polymath. Born in Milan in 1891, Giovanni Ponti graduated in architecture in 1921; he opened his own architectural firm, but soon started nurturing a strong interest for art and in particular painting and the power of craftsmanship. Between the early '20s and the '30s Ponti worked for the Manifattura Ceramica Richard Ginori creating for them revolutionary pieces: he often combined in his Richard Ginori designs architectural features and geometrically minimalist lines and motifs borrowed from art movements (as the years passed these pieces ended up inspiring fashion creations, including Salvatore Ferragamo's shoes). Presented at the Biennale of the Decorative Arts in Monza, the pieces won him in 1925 the Grand Prix at the Parisian Exposition des Arts Décoratifs. In the following year, Ponti designed his first building abroad, Villa L'Ange, and collaborated with Christofle in Paris and Venini in Murano. He also developed for Italian department stores La Rinascente, a series of modestly priced furniture characterised by simple shapes and silhouettes to make sure decorative arts became accessible to as many people as possible. In the 1930s, he focused on the construction in Milan of the Case Tipiche and offices of the Montecatini company, and produced lighting for FontanaArte, cutlery for Krupp and fabrics for De Angeli-Frua and Ferrari. Ponti brought changes not just to architecture and interior objects, but to graphic design as well: he directed the magazine Domus until the early '40s (and then again from 1948 to August 1979), coming up with innovative covers, at times suspended between art and fashion. During the 1940s, Gio Ponti produced monumental frescoes at the Palazzo del Bo at the University of Padua: this work marked for him a return to oil painting, but during the same decade he also worked on creating screenplays and on designing sets and costumes for La Scala in Milan. The transition to the '50s brought two new designs on the scene: La Cornuta (1949) for Pavoni, a horizontal coffee machine with a snail shape designed to prevent the smell of burnt coffee, and the Leggera chair (1951) for Cassina (followed by the Superleggera in 1957), while in the next decade Ponti worked on architectural orders in Venezuela, the United States, the Middle East and Hong Kong. 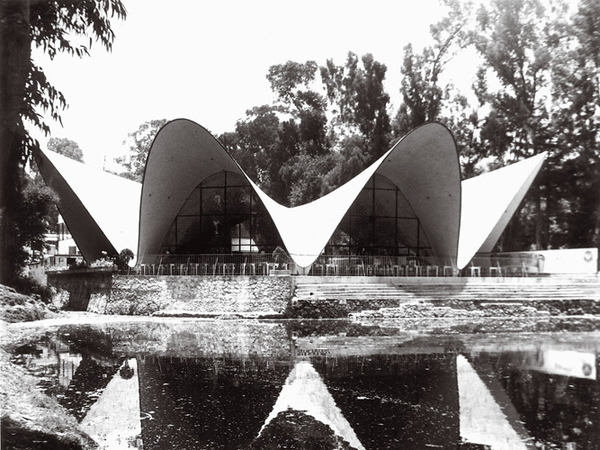 Ponti then designed two masterpieces, Planchart Villa in Caracas and the new headquarter for Pirelli. The latter was designed in 1950 (and completed in 1961) with architects Antonio Fornaroli, Alberto Rosselli, Giuseppe Valtolina and Egidio Dell'Orto and engineers Arturo Danusso and Pier Luigi Nervi. A decade later Ponti designed the Concattedrale Gran Madre di Dio in Taranto, one of his last large scale projects, characterised by diamond-shaped windows (one of the Gio Ponti inspirations in Riccardo Tisci's Givenchy Pre-Fall 2013 collection) that seem to frame sections of the sky. Ponti's search for transparency and lightness is clear in the architectural facade of this building and in the openwork geometrics of a later design, the Denver Art Museum (1974). Curated by Olivier Gabet together with Dominique Forest, Salvatore Licitra and Ponti's great-great niece Sophie Bouilhet-Dumas, the event at Les Arts Décoratifs explores different works in a time-frame between 1921 and 1978. Visitors are greeted by a recreation of the Taranto Concattedrale facade that acts as a sort of introduction to the objects, furniture and architecture on display in the museum spaces: there's proverbially something for everybody here, from architectural drawings, photographs and models (the Montecatini building in Milan; Palazzo Bo at the University of Padua; Casa Ponti in via Dezza, Milan; the hotel Parco dei Principi in Sorrento and Villa Planchart in Caracas) to interior design pieces and textiles (it is worth remembering that Ponti created fabrics, but also designed a Visetta sewing machine in 1949). Apart from featuring pieces made in collaboration with other companies and manufacturers, there are also objects created with craftsmen including ceramic, glass and goldsmithery pieces. Ponti favoured surface effects and intriguing colour combinations, loved to play with shadows and lights and injected a poetically sublime weightlessness in his furniture. According to him art, architecture and design had to come together in a house to guarantee to the people living inside it not just a comfortable living space, but also genuine inspiration. Design had indeed to be functional and practical, but it also had to stand out. The principle behind this event, including over 500 pieces, some of them showed in France for the first time, is borrowed from the slogan "from the spoon to the skyscraper" attributed to the Italian architect Ernesto Nathan Rogers (1909-1969). Ponti was indeed a prolific creator, a quintessentially modern figure who combined crafts with industrial design and was therefore capable of working well on all sorts of projects, from small objects to buildings. This exhibition is recommended to all those young creative minds who may not be so familiar with Ponti, but it is also a great opportunity to discover Ponti's modus operandi and the way he seemed to effortlessly move from one medium to the next thanks to an all-encompassing approach that meant he was equally interested in architecture and in the decorative arts (something that Alessandro Michele at Gucci has been trying to do, working between fashion and interior design and doubling as Creative Director at Richard Ginori...). "Tutto Ponti" is a long journey through the archi-designer's opus, but it is also a cause of celebration for the museum: in the '70s the Musée des Arts Décoratifs had tried to arrange an exhibition, but the project was cancelled when Ponti died in 1979. Almost forty years later, Les Arts Décoratifs has kept its promise, bringing Ponti to Paris and renewing his design legacy. Wanda Miletti Ferragamo, wife and widow of shoemaker Salvatore Ferragamo, died on Friday afternoon in Fiesole, near Florence. The couple's children Giovanna, Ferruccio, Leonardo and Massimo, announced their mother had passed away at 96, remembering her in a note as "an example of rectitude and great passion for life". Widely considered by many fashion designers in Italy and abroad as the quintessential fashion matriarch, Signora Wanda was born in Bonito, outside Naples, like her husband Salvatore Ferragamo. Salvatore first studied shoemaking in Naples, then emigrated to the States in 1914, moving to California where he opened a repair and made-to-measure shoe shop that became popular with Hollywood stars. After studying anatomy at the University of Southern California to understand how to design and make comfortable shoes, he went back to Italy where he established his business. Salvatore met Wanda when he returned to Bonito to pay a visit to the town in 1940. In a chapter of Salvatore Ferragamo's autobiography, Shoemaker of Dreams, the author remembers how he instantly fell in love with her. A few weeks later, on 9th November, they were married in Naples, even though her father disapproved of the match because Salvatore was 25 years older than Wanda. In Shoemaker of Dreams, the description of the marriage only takes up a few paragraphs: after the wedding, the couple went to Sorrento for a brief honeymoon; that day the Allies bombed Naples and all their guests ended up spending the night in the city's shelters. The couple moved back to Fiesole and had two children, but the first years of marriage were disrupted by the war. Ferragamo, who didn't like politics and hadn't taken any position, was accused of being an American spy by the Germans and a spy for the Germans by the Allies; partisans accused he had collaborated with the Germans and had Fascist sympathies (he had made shoes for Eva Braun before the war, for Mussolini, for his wife Rachele and for his lover Claretta Petacci), while the Republicans accused him of having Monarchist sympathies (he had made shoes for the Queen of Italy; while he lived in the States Ferragamo had adopted a very simple rule – he would make shoes for whoever asked and whoever was in power, Democrats or Republicans; when he went back to Italy he followed the same principle but it ended up playing against him during and after the war). The family returned to their normal lives at the end of the conflict: the workshop in Palazzo Feroni-Spini was restored (bought in the '30s, the palazzo later on became the Ferragamo Museum) and by 1947 the company was exporting shoes again to Europe and the United States. Ferragamo could once again boast famous celebrities among his clients, including Marilyn Monroe, Audrey Hepburn, Elizabeth Taylor and Sophia Loren. Salvatore died prematurely in 1960 at 62, but by then he had already developed a well-established company and patented some of his designs and unique features including platform shoes, the "Invisible Sandal" made with a nylon monofilament, and the "Kimo" a shoe comprising a sandal and a sock in coloured leather. Wanda, who was left at 39 with 6 children, took charge of the company, turned into an entrepreneur and continued to build on his vision together with her 16-year-old daughter Fiamma, who seemed to have inherited her father's talent for designing shoes. Fiamma later on designed the iconic Vara pump, characterised by a grosgrain ribbon and a metal buckle; her sister Fulvia worked instead as creative director of men's and women's silk accessories, producing another popular Ferragamo item, the silk scarf, made in Como. Fiamma died in 1998 and Fulvia in April this year. Listed on the Milan Stock Exchange in 2011, the Salvatore Ferragamo group went through ups and downs and in recent months had to dismiss rumours about a possible sale (in July 2018, the group appointed Micaela Le Divelec Lemmi as new CEO and investments were announced to relaunch the brand). Wanda received many awards during her life: named a Knight of Industry by the Italian Republic in 1987, she received the Fashion Group Award in 1991, the "Mary Ann Magnin Award" in San Francisco in 1992 and, in 2004, she was named a Cavaliere di Gran Croce by the Italian government. Described by the people close to her as kind and generous, Wanda Ferragamo managed to balance family and work throughout her life: since 2006 she was a honorary president of the company, regularly attended the brand's shows in Milan and visited the offices up until a few weeks ago. Signora Wanda is survived by four of her six children, Giovanna, Ferruccio, Massimo and Leonardo.